Looking for an SUV that packs a punch? If so, you have come to the right place! The 2019 Durango is quite a powerful SUV, offering all the muscle that the Dodge brand is known and loved for. Entering the 2019 model year, this SUV is loaded with incredible features from infotainment systems that will keep the kiddos in the back entertained to driver assistance features that will keep you safe at every turn! We cannot forget to mention the incredible engine options available for the new model year! They definitely pack a punch! 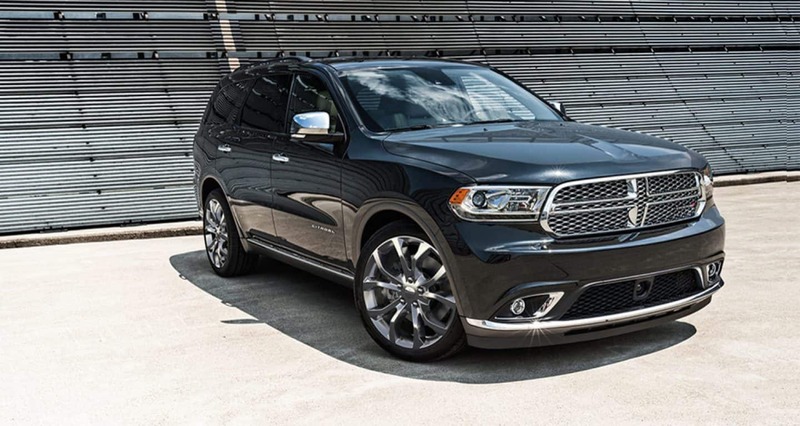 Check out the rest of our 2019 Dodge Durango review to learn even more about this outstanding SUV. Can you tell us about the Durango's features? Dodge is offering the crossover Durango in a total of five trim levels for the new model year. They range from the entry-level SXT to the beast known as the SRT. Standard features for the 2019 model year include a rearview camera, 18-inch alloy wheels, folding third-row seat with 50/50 split, folding second-row seat with 60/40 split, a load-leveling rear suspension, keyless entry and ignition, heated exterior mirrors, a leather-wrapped steering wheel, fog lights, smartphone integration, six-speaker sound system, Bluetooth, 7-inch touchscreen, two USB ports, and cloth upholstery. Higher trim levels come outfitted with features like an auto-dimming rearview mirror, a larger touchscreen, sunroof, cargo cover, premium sound systems, enhanced brakes, performance tuned steering and so much more! There are quite a few packages available for the new model year as well so you can customize the Durango to meet all your needs! What kind of power does the Durango offer? There are quite a few engine options available for the new model year. The standard engine is the Pentastar, this 3.6-liter V6 engine generates 260 pound-feet of torque and 293 horsepower. This engine boasts the best-in-class V6 towing at 6,200 pounds and comes outfitted with engine start/stop technology. The second engine available for the Durango lineup is 5.7-liter Hemi V8. This engine outputs 390 pound-feet of torque and 360 horsepower. Boasting the best-in-class V8 towing at 7,400 pounds, this engine is outfitted with Fuel Saver Technology. The third engine available powers the SRT model. This 392 Hemi V8 engine puts out 470 pound-feet of torque and 475 horsepower. This much power sends the Durango SRT model from 0 to 60 miles per hour in just under 4.4 seconds. This engine also boasts a best-in-class towing capacity of 8,700 pounds. Does the 2019 Durango offer any safety features? The Durango has your back with a wide variety of safety and security features. In fact, there are over 60 different features available for the 2019 model year! Some of these features include Uconnect Access which opens the doors to roadside assistance and 911 call, Blind-spot Monitoring and Rear Cross Path detection so you can change lanes with ease and peace of mind, and adaptive cruise control with stop. Some other features you may find include front-row active head restraints to reduce spine and neck injuries in the event of a rear-end collisions and airbags. There are a total of seven airbags installed throughout the SUV, including front-seat-mounted side-thorax airbags and three-row full-length side-curtain airbags. Needless to say, the Durango is incredibly safe! The 2019 Dodge Durango is a fantastic option for those that are looking for a family-friendly SUV that still has some serious power underneath the hood! Would you like to learn more about this SUV and all that it has to offer? You can reach out to our sales team by calling them at 888-659-7908 or you can visit us in person at the dealership today!